COMPETITION: #Win @BallerXtreme Fitness App and Get Fit on the Go! I love the sunshine, but I feel that the bikini season arrived too quickly this year. I am not complaining, just didn’t have much time to get my beach body ready. Luckily Baller Xtreme’s fitness app has been launched, with a series of workout videos. You don’t need any DVD player to complete the programme, no in-app purchases, and no equipment needed. Simply one-off payment of £9.99 for the app, and you can get your beach body ready in no time. No matter where you are, Baller Xtreme can be your personal trainer. 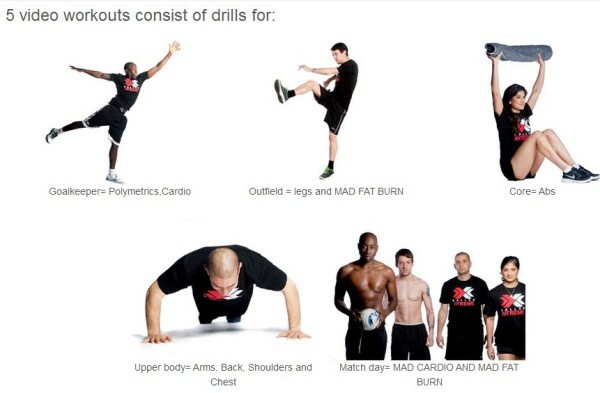 You can do this workout anytime, anywhere. Baller Xtreme is a new and exciting 5 video workout. You can get amazing results in just 60 days. So, if you want to get footballer fit and think you can do the same drills they do – this app is for you. You can use it in your home, at work, in the gym, at the park anywhere 3G, 4G and wi-fi is available! Baller Xtreme app is suitable for boys and girls. Each day for 60 days Baller Xtreme would cover each position: Goalkeeper, Outfield, Core, Upper Body and Match Day. – A calendar so you know what workout to do each day, for 8 weeks. – Share photos that you have added and invite friends on Facebook, Twitter, Instagram, whatsapp and email. – Add friends who are doing the workout with you. For your chance to win a Baller Xtreme app, please enter via the Gleam app below. You MUST leave a comment and subscribe by email (compulsory entries), you can also gain extra entries by tweeting (daily entry), subscribing to other social media channels, etc. 19 Responses to "COMPETITION: #Win @BallerXtreme Fitness App and Get Fit on the Go!" Do different classes or sports to keep your interest! Try to do some regular exercise. Walking and swimming can be beneficial. Hula with a weighted hoop at work during your break and get your colleagues to join in. I recommend getting a personal trainer to show you the ropes at the gym and they will often create a tailored plan for you. It’s what I’ve done and I’ve lost 33lbs in 3 months! 5 inches from my waist and 4 from my hips! I find doing something I enjoy makes exercise fun. I love swimming so I do that once a week. Try zumba videos on youtube! My best fitness tip is to try classes to find something that works for you and more importantly that you enjoy, I love zumba!